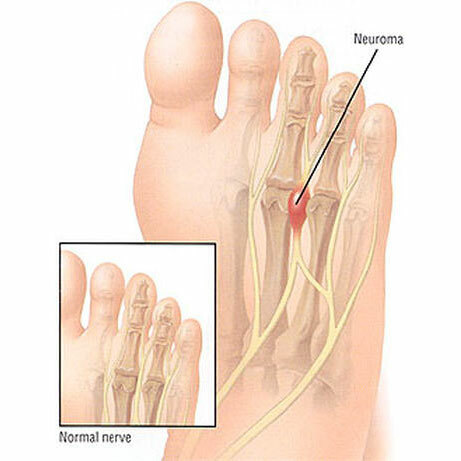 A neuroma is a thickening of nerve tissue and Morton’s neuroma is a swollen, inflamed common digital nerve located between the bones at the ball of the foot. The most common location is in the second (between second and third metatarsal), and the third (between third and fourth metatarsals) spaces. This can cause a sharp, burning pain in the ball of your foot and sometimes the pain radiates to the toes. Ill-fitting footwear such as shoes with narrow toebox, high heeled shoes or shoes with pointed toes. Being active and playing high impact sports that involve running and placing high pressure on the forefoot such as racquet sports. Foot deformities — Pes planus (flat foot), bunion and hammer toes, tight calf muscle (equinus deformity). Tingling, burning, or numbness of toes. A feeling that something is inside the ball of the foot. Clinical presentations and examination (positive Mulder’s click). Imaging — X-ray to rule out other differential diagnosis, ultrasound, MRI. Padding: Padding provides support for the metatarsal arch to reduce the pressure on the nerve and decreasing the compression force on weightbearing activities. Orthotics: Custom orthotics aim to reduce pressure and compression on the nerve if faulty foot biomechanics are present. Activity modifications: Activities that put repetitive pressure on the neuroma should be avoided until the condition improves. Footwear modifications: Wear shoes with a wide toe box and avoid narrow-toed shoes or shoes with high heels. Injection therapy: Treatment may include injections of cortisone, local anesthetics or other agents. Surgery may be indicated if patients have not responded adequately to conservative treatments. Typically neurectomy is performed to remove the problematic neuroma under anaesthetics (general or local).